Border Gold Corporation is one of North America's leading precious metals dealers, serving clients in both the United States and Canada. Based in British Columbia, Canada, Border Gold specializes in customer relationships and competitive pricing. 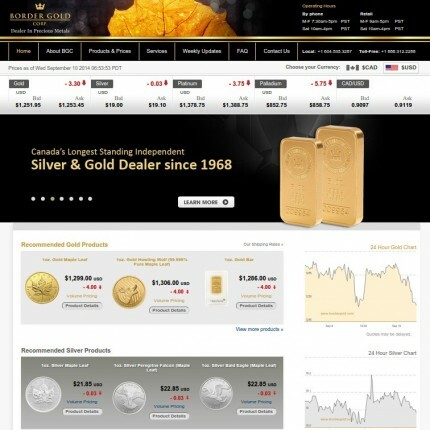 Their special relationship with the Royal Canadian Mint and other distributors allows consistently competitive pricing. When trying to find a PM dealer, a number of questions should be asked. Do they have a good third party rating? Are they price competitive? Are their shipping and handling charges reasonable? And most of all, can you trust them. By doing your homework you should be able to answer the first three questions. I did and BG ranked in the top echelon of dealers, especially for Canadians. The last question is harder - you have to put your money on the table. I did and am very happy with the service and the product. So they have my trust now. All my future dealings will be with them.Highly recommended. A note fro Canadians: they ship Canada Post so you don't run into the custom brokerage charges UPS and FedEx charge.